The Great Vine, the Mother, Vine of Souls, Aya, Yagé.... This powerful Amazonian plant medicine has been attributed with many names, but the important thing is that it is finally receiving worldwide recognition for its healing capabilities. The plant mixture that is ayahuasca brings about an altered state of consciousness. The experience usually lasts from four to eight hours. We consider it to be a medicine, and the physical effects can be quite different to those sought when a person is trying to 'get high' on a psychedelic substance. Although the medicine can produce strong visual experiences, it should be treated as a healing modality. The intelligence in the plant knows the intention of its users, and those with weak intent may be in for a surprise! At Magnetic Movement we feel that this medicine should be imbibed in an appropriate ceremonial setting and always under the supervision of an experienced, trained shaman. 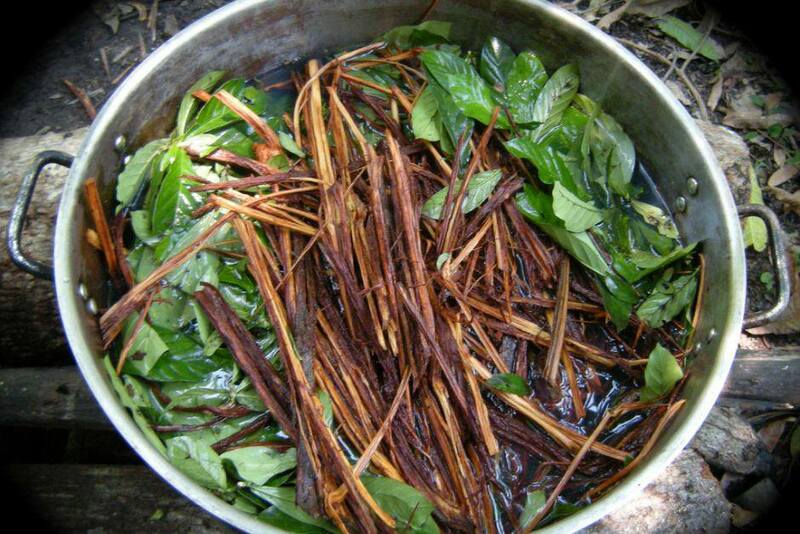 The ayahuasca brew constitutes Banisteriopsis caapi (the vine, also called ayahuasca) and the chacruna leaf (psychotria viridis) or chagropanga (diplopterys cabrerana). The latter plants contain the psychedelic substance that the brew is famous for: DMT (N,N-Dimethyltriptamine). Ayahuasca is all about the journey within. This powerful medicine has the ability to take us on a 'soul journey'. Whatever it is that you need to encounter, this medicine is the one. Often, what we most need to encounter is what has caused us the greatest upset, damage, or wounding. We tend to bury it deep inside, where it literally rots us away; unresolved material that motivates our unconscious thoughts, actions and reactions, essentially keeping us chained to it until we resolve to resolve. it. Ayahuasca takes you on a journey characteristic of the form of the vine itself; winding, twisting and into the depths of the forest earth. This does not mean that such a journey can be predicted. A common trick of the ego, we think we can foresee what it is that we will learn, but the medicine knows exactly how to get around the ego in order that we truly do learn what is necessary. What we find is often surprising; it's hard to imagine how detached we have become from the heavy loads we carry. Nevertheless - and however challenging the experience - the exhilaration that comes with release should not be underestimated. The truth is, you can't. Each journey is different, every time, and for every person. However, there are often parallels that can be drawn, themes that we experience as human beings, and these help us to connect to one another. There need not be a challenge with ayahuasca, but if there is, it is nothing to fear. After all, it is often true that spiritual growth comes easier from challenge. What is certain is that she will give you whatever it is that you need, whether that is total bliss, or total challenge. Here's an account of one of my Peruvian experiences, to give you an idea of possibilities. Many anecdotes will attest that ayahuasca has a way of calling you when it is time. Whether you just feel a powerful urge to experience it, you have dreams about it, or you find yourself having synchronistic conversations and happenings relating to it, you will probably agree with hindsight that the intelligence in the plant already knew you - better than you know yourself. That is something that only adds to the awe, appreciation and mystery! The ayahuasca experience is a ride, in many respects. An 'other worldly' one, for sure. It does require one main thing from you; the ability to let go. As in every day life, resistance is pain. Control is a very 'human' tendency and most of us suffer from the need to control to various degrees. With this medicine, control is likely to be dealt a blow... so, go with the flow.